Baptisms - Fortunately & Unfortunately? I find it simply amazing to believe that Lexie and I met for the first time one year ago on Friday May 25, 2007. She was so frightened and uncertain. Who can blame her. I looked, sounded, and smelled different from anyone she'd met plus we met in a VERY small room with Lexie & Mueret -her head caregiver- another caregiver holding another baby from her group they were introducing me to, the director of the baby house, the pediatrician of the baby house, my coordinator, the interpreter, Rosa the other single mom adopting from Spain and the 3 1/2 year old girl she was adopting plus her caregiver, my mom and myself. All of us in a room no bigger than 5 by 8 with two overstuffed chairs, a small table and bookshelf. Did I mention it was about 85 degrees outside and I don't even want to think how hot is was inside with all those bodies and no AC - not even a fan. Plus with all the emotions I was feeling and all the talking in different languages, I am amazed I didn't run out of there screaming. I certainly felt like it. When they gave me Lexie for the first time she pushed at me with both hands with all her might trying to get away from me and then cried and reached out to her caregiver. They warn you that kids who CAN attach will often have stranger anxiety and that is a good thing. I thought I was prepared for it until this child they are encouraging me to agree to "bond" with is clearing not interested in bonding with me or having anything to do with me for that matter. 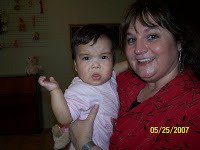 But it was really brought home to me how correct they were about that when the other baby girl, who was 14 months old, let me hold her and then just sat in my lap and stared at me. That was very disquieting and really sad. I felt like she didn't know what to do if someone held her and had learned not to object to anything that was done to her. At least Lexie felt enough confidence in herself to object to someone she didn't know. And object she did. They also brought in two baby boys, one who was about a year but looked very thin and unhealthy and then I asked to see the little foundling boy Stephanie (one of the families that was there just before me) told me about. This poor baby had been found on the streets by a policeman at around 6 months old they thought and had been at the baby house for a year. He was just terrified and confused and didn't look well either. I am happy to report the first little boy was adopted and is doing just great. He is actually very chubby now and on target for his age. The foundling unfortunately is still at the baby house as far as I know. Anyway, I agreed to start "bonding" with her that afternoon and when we came back for our first private visit Mueret played Hide & Seek with me holding Lexie and Mueret hiding and then leaving. She was very understanding about how to make the transition easier on Lexie. But the 2 hour visit was tough since she never really relaxed. We got a chance to take her clothes off and saw all the bug bites and scratches on her. I was so sad and very unsure if adopting her was the right thing to do. We went back to the apartment that night and I told Mom I just didn't know - that I didn't feel any connection to this child. Mom said let's just visit her over the weekend and if I still felt that way then we could call my coordinator back in the states and let her know what's up. Thanks Mom for your wisdom and fore site. 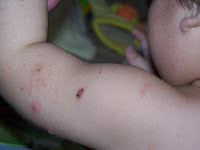 The next day the morning visit was outside because they were fumigating the building due to a "bug infestation" and all the children and caregivers where out in the "playground." Even though there must have been at least 50 babies out there, I saw her right away and when she smiled at me I just knew everything was going to be alright. Now it was probably gas or simply being outside for the first time in her life but that smile was so beautiful to me and when I took her from Mueret she was smiling and laughing and a completely different baby. It was like she was saying "hey I know you - you came back." And that's just how I felt. My heart knew her even if my head needed some time to catch up. At the end of the second visit that day she didn't want to go to the caregivers, which surprised us all. Each visit just go better after that and by the time I took her out of the baby house for the last time, no one would have questioned that we were mother and daughter. So I spent the rest of this May and June reminding her (and anyone else I talked to) what each "anniversary" was. The day we meet (Friday May 25th), the end of the bonding period (June 8), the court date (Monday, June 18th) one of the toughest days of my life and June 19th when they finally gave us the "positive court decision" but of course we had to wait the 2 weeks for the "final decision" on Wed July 4th which was Lexie's Freedom Day. What a wonderful day to take her out of the baby house for good!!! Friday July 6th was the day I received Lexie's new birth certificate with her new name on it as well as me as her mother. It was amazing to see it in writing, even if it was in Russian. 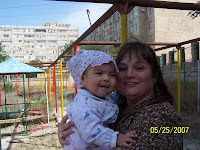 Then came Tue, July 10th, our last day in Aktau when we flew to Almaty which also made it's Lexie's first time on a plane. We finally made it to the US Embassy on Wed July 18th (boy was it nice to her unaccented English again) and we flew out of Kazakhstan Friday July 20th at 3am and landed in Houston Texas when Lexie officially became an American Citizen on Sat, July 21 where she met most of HER new family for the first time. Finally we landed in Washington state on Thursday night Aug 2 where she spent her first night in her crib at home. Which officially ended all of our anniversaries. Needless to say everyone was very sick of me calling almost every day of the summer with some kind of anniversary or saying "this time last year we were..." So thank you for putting up with me but when something so big and so wonderful happens to you, well you can help but want to celebrate. So thanks for walking down memory lane with me and I promise to TRY to do better next year. 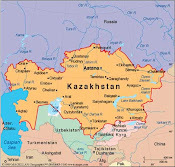 Maybe I'll be back in Kazakhstan meeting Lexie's brother or sister and creating more new firsts!!! You just don't know what the Good Lord has in store for us. Our first picture together. Note the sweat pouring down my face and the worried look on Lexie's. She doesn't even look like herself! This is that second morning together when I saw her in a sea of faces. See how much more relaxed and happy she was and so was I! Just some of the babies that where brought outside so they could fumigate the baby house that day - part of the Sea of Faces. I pray that some of these children are now home with their families or have found new families to love them. 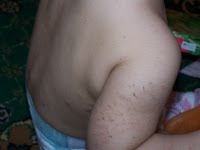 I decided to post these pictures (click on the pictures to make them bigger - especially her feet) of Lexie's "skin condition" so that other families traveling to Kazakhstan to meet their children won't be as surprised as I was. Ninety-five percent of this was cleared up in a couple of weeks with Benadryl and anti-biotic ointment that I happen to have brought with me. Her caregiver asked me what the miracle drug I used on her was. 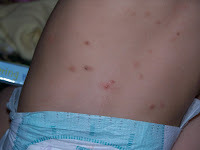 The rest was the result of the scabies she had (and I got) but that too was cleared up once we returned home and received the proper treatment. 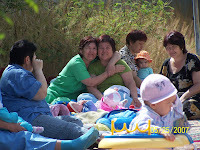 I didn't originally post these because I didn't want to take the chance that some Kazakh official monitored these blogs and it affect her adoption. Now I want other families not to worry too much if they find something similar when they first meet the children. We have so much at our disposal here in the states and these babies will benefit from that once you get them home. I was simply amazed at how happy and outgoing she was during our visits while dealing with the discomfort this must have caused her. Love and Benadryl are a wonderful combination!! Unfortunately, the second half of our trip to Houston in May consisted of us saying good-bye to Lynn & Brooke who had to return home and couldn't be there for the Baptisms. Fortunately we then got to celebrated my brother-in-law Jim's birthday - Happy B-Day old man. The picture of Lexie and Jim with the bug eyed look is a favorite of mine. It's from back in Dec so her hair was shorter (and I think Jim's was longer) but they look adorable together. 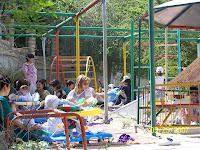 Then it was play time for the kids for a couple of days and they had a blast together. We are so blessed to have such a wonderful family and even more blessed that we actually enjoy each others company. Lexie didn't stop moving from the moment she woke up until I could get her to put her head down to sleep. I just had to include these pictures of baby Blake - he's 7 1/2 months here and just a happy baby, Cody 9 1/2 - what a smart, handsome, charming boy he is and sweet Mackenzie (Z - but only Lexie and I get to call her that) 7 1/2 and what a beauty plus she loves to play with Lexie and all her pet shop friends and Brooke 8 1/2 going on 28 1/2!! She's growing up fast on us but still loves playing with her cousins and being the life of the party. I just wished we lived closer so we could enjoy more moments like these. On to the Baptisms (which happened on May 24th but I didn't get this posted until much later.) It too was a day of unfortunates & fortunates. Both Lexie & Blake were being Baptized on the same day - that was a fortunate. 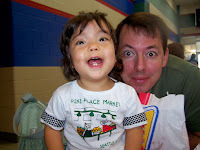 My younger brother Todd & I were to be Blake's Godparents and Angie & Jim Lexie's. So it should have been fortunate since we all would be there for each other and we'd just have to do a little baby switching on the alter. Unfortunately my brother Todd and his wife Lori, couldn't make it at the last minute (we got the call at 5pm the night before) but fortunately Jim's brother, Mike, kindly stood in for Todd with both the kids even though he isn't Catholic. I know I was very grateful to Mike and his wife, Paige & their two girls, for coming even though it was their moving day. Unfortunately my little sweet pea who usually wakes up with a smile on her face and doesn't take it off until she falls asleep, woke up fussy and stayed that way for most of the day. It's hard enough getting a just turned two year old to put on tights, a fancy dress and do her hair up when she's in a good mood but try it when she's crabby. Pretty soon so was I. You'll notice there are no pictures of us together because, well, there are no decent pictures of us together. She's either turned away or crying or pulling on my hair or trying to get down or I have a look of utter frustration on my face. What can I say - we both had an off day and it was reallllllly hot once we got to the church, which certainly didn't help. Oh yeah, and unfortunately her shoes got left at home (we won't go into why because no one can agree) but the bottom line is Lexie got baptized without her tights and shoes. 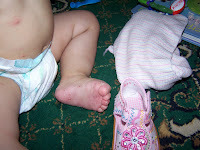 Yes, my always well dressed and looking oh so cute daughter, got baptized in her bare feet. I'm sure the Good Lord didn't mind but her mommy wasn't happy about it. Fortunately, cousin Blake was an angel the whole time from getting dressed to taking pictures to the ride over - right up until Father put the holy oil on his forehead. Unfortunately, he let out a scream I'm sure they heard in Heaven and didn't stop fussing until we walked out the church doors. Now as his Godmother, I went from my fussy daughter to a screaming Blake so all three of us felt like crying before we were done. We were definitely ready to walk back up the aisle when it was all over and I'm sure the rest of the families where glad to see us go too. Fortunately, things did calm down once we went to the restaurant to celebrate and the kids were changed out of their dress clothes but it wasn't what we had planned. I'm learning that's how things happens more often than not with kids and the funny thing is, I wouldn't change any of it. Life would be boring if everyday was perfect and just how we planned it. I wouldn't have Lexie if things had gone as I planned. So I'll leave the planning in Gods hands and learn to go with the flow. He did a great job with Lexie so we'll see what He has planned next for us. Oh yeah, fortunately the Baptisms are done and we're on to our next event - Vacation in Mexico!!!!!!!! But that's another story.